Shirley Ruth Jeffries of Blackwell, Oklahoma, died early Sunday morning, November 4, 2018, in the Oklahoma Heart Hospital in Oklahoma City at the age of 78 years. Shirley Ruth Jeffries was born on February 2, 1940, in Bartlesville, Oklahoma, to John Lee and Alta Hazel “Rose” (Black) Mardis. She attended schools in Bartlesville, Blackwell and Modesto, California. Following her education she served her family as a homemaker. In 1963 she returned to Blackwell and worked at various jobs. The family then moved to Arizona before returning to Blackwell where she continued in the home. In 1965 they moved to Ft. Worth, Texas, before returning to Blackwell in 1970 when she began working as a waitress at the Plainsman Restaurant and later Scotty’s Corral Truck Stop in Tonkawa. In 1983 they moved to the Florida Keys where she worked as a bookkeeper. In 1998 they returned to Blackwell and she married Keith Jeffries on May 27, 2006, and they made Blackwell their home. She enjoyed attending and having garage sales. Her greatest love was cooking for various family events. 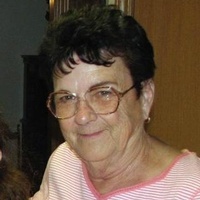 She is survived by three sons, Lee Jay Sewell of McAllen, Texas, Bart Sewell of Ponca City, and Jeron Sewell of Russellville, Arkansas; a sister, June McBride of Blackwell; and numerous grandchildren and great grandchildren. She was preceded in death by her parents; her husband; two brothers, John and Richard Mardis; and a sister, Bonnie Runge. A memorial service is scheduled for 10:00 a.m., Saturday, November 10th in the Roberts and Son Funeral Home Chapel with James W. Roberts officiating. Honorary casketbearers will be the Sewell and Jeffries families. In lieu of flowers a memorial has been established in her honor with Associated Charities in Blackwell in c/o Roberts and Son Funeral Home, 120 W. Padon, Blackwell, Oklahoma 74631.